Thank you, your message has been sent, we will reply as soon as possible. There are a lot of markings on the side of a tyre, but what do they all mean? We’ve created this guide so you know exactly what all the different markings on your tyres relate to. 1. Energy Saver+ This denotes the name of the tyre. 2. 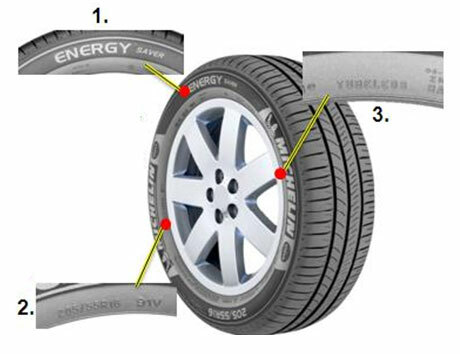 205/55/16 19V This is the size and characteristics of the tyre. When ZR ratings were introduced, they reflected the highest tyre speed rating ever likely to be required, in excess of 150 mph (240 km/h). However, how far above 150 mph was not identified. W (169mph) & Y (187mph) ratings were subsequently added to identify tyres that meet the needs of newer high performance vehicles that have very high top-speed capabilities. This may not be the case with all tyre manufacturers so please ask if your unsure. RF and XL markings indicate tyres designed for load capacities and air pressures higher than those of standard tyres. Extra Load tyres have increased load carrying capacity and achieve this by using higher inflation pressure. They have the same load carrying capacity as Standard Load tyres have at 35 psi, and have more load carrying capacity as the pressure increases - up to a maximum of 41 psi. XL designations are predominantly used for car tyres and RF designation predominantly used for van tyres. XL and RF tyres are however not interchangeable and mixing these two types of tyres could lead to poor handling. If higher load tyres are originally fitted to a vehicle, the lower load version is not a suitable replacement. Even though a tyre manufacturer may produce an equivalent tyre size that is not OE marked and approved, it’s important to fit the OE approved tyre all round to ensure the your vehicle continues to perform exactly as the vehicle manufacturer intended. Tyre Labelling is an important initiative which enables the motorist to better understand the real impact that tyre performance can have on their lives and on society as a whole. It measures 3 areas of performance. All content Copyright © 2019 Freeway Exhaust and Tyre Centre.